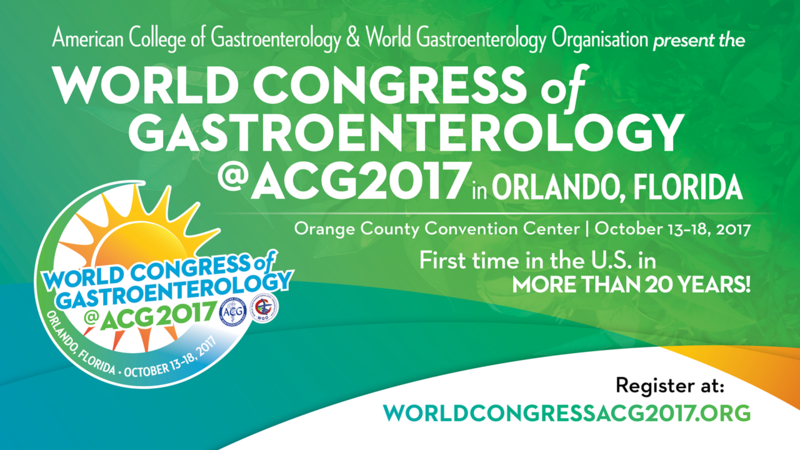 The next World Congress of Gastroenterology, the World Congress of Gastroenterology at ACG 2017, will be held in partnership with The American College of Gastroenterology (ACG) Annual Scientific Meeting and Postgraduate Course, 13-18 October 2017 in Orlando, Florida, USA. REGISTER NOW FOR THE CONGRESS! Call for Abstracts now open for WCOG at ACG2017! Learn more here! NEW! View the Advanced Registration Program here! Download the Official WCOG at ACG 2017 Flyer in English and Spanish! Explore Orlando! View the WCOG 2017 Brochure for more about the meeting and what to do and see in Orlando!